It took 23 fights in the hallowed Octagon, but Dustin Poirier ended UFC 236 as a UFC champion. UFC 236 took place at State Farm Arena in Atlanta, Ga. with a pair of interim titles on the line. The featured bouts included Poirier (25-5 MMA, 17-4 UFC) taking on UFC featherweight champion Max Holloway (20-5 MMA, 16-5 UFC) for the interim lightweight title. The bout was a rematch of a February 2012 bout in which Poirier beat Holloway in the Hawaii native’s UFC debut. Poirier opened the frame with big leg kicks that opened up strikes to the head before Holloway started to land his own big shots in return, appearing to hurt the lightweight regular. Poirier began landing heavy bombs to the head of Holloway repeatedly, briefly stealing control of his legs on multiple occasions. The fighting spirit and instincts of Holloway allowed him to survive the first round and the shock of the power he was tasting at 155 pounds. Despite having just survived one of the worst rounds of his professional career, Holloway opened Round 2 with a smile for Poirier. The smile may have been born of the decision to begin working to Poirier’s body. As Round 2 wore on, Holloway landed strikes at a higher rate, but Poirier’s power shots were still able to find the increasingly bloody and swollen face of the featherweight champ. With a minute left in the second, Poirier again appeared to hurt Holloway and force him to retreat to add some question to the winner of a round in which Holloway was gaining traction. Holloway continued to have moments in Round 3. But every time he appeared to gain momentum he was stung by the heavier counters of Poirier. He ended the round with his face showing a large amount of damage and time slipping away for him to do enough work to win a decision. Poirier wanted the takedown early in Round 4 but when he couldn’t secure it Holloway tried again to turn up the pressure with flurries of punches. With Holloway’s increased focus on attacking to the body, Poirier appeared to start running low on energy. However, a massive Poirier knee caused Holloway to begin gushing blood from a deep gash over his left eye. In the final five minutes of the fight, the story of Holloway’s volume vs. Poirier’s power continued to play out. With a face covered in blood and a clear power disadvantage, Holloway continued slinging punches and eating counters down the stretch but Poirier smothered with a takedown attempt in the final minutes to run out the clock. All three judges scored the fight 49-46 for Poirier, awarding him the interim lightweight championship. Next up for Poirier could be a bout with “full champion” of the lightweight division, Khabib Nurmagomedov. 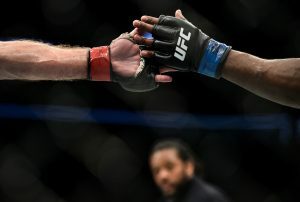 With the interim UFC middleweight championship on the line, Kelvin Gastelum (16-4 MMA, 10-4 UFC) and Israel Adesanya (16-0 MMA, 6-0 UFC) appeared as relaxed as could be expected coming out of their corners for the opening round. Adesanya scored a few strikes in the early stages of Round 1, but a Gastelum right hand briefly buckled the legs of the younger challenger. After feeling the early power of Gastelum, Adesanya seemingly took his foot off the gas a bit and attempted to figure out a plan of attack. Round 2 proved to be Adesanya’s first showcase of his own power as he scored with a right hand for his own knockdown. After Adesanya had to make the adjustments in Round 1, Gastelum found himself eating heavy strike after heavy strike in Round 2. He seemed one or two strikes away from being finished before making it to the horn, which signified the end of the five-minute period. Both men would have their moments as the fight pushed into the “championship rounds” (rounds 4 & 5) but Adesanya’s shots were still scoring knockdowns, even in the fifth and final frame. Gastelum refused to back down, continually trying — and often succeeding — to land his heavy punches but Adesanya was slightly more accurate and his clean shots were able to do more damage. Light heavyweight Khalil Rountree Jr. (8-3 MMA, 4-3 UFC) wanted to improve his muay Thai game so badly he traveled to Thailand ahead of his bout with Eryk Anders (11-4 MMA, 3-4 UFC). This proved to be a wonderful career investment as Rountree scored a dominant unanimous decision victory on the strength of his striking game. Rountree’s leg kicks were coming fast and hard early in Round 1, reddening the lead leg of Anders. As Anders’ attention drifted to defending his leg, it opened up his head for Rountree’s heavy punches. With leg kick after leg kick landed for Rountree going into Round 2, a left hand briefly dropped an increasingly overwhelmed Anders to his back. Anders got back to his feet only to eat another flurry ending with a right hand that dropped him again. Minutes later, the double-tough Anders was dropped again. But he refused to quit, and survived to the end of the second frame. Anders was in survival mode for Round 3 as Rountree stalked him, with any strike he felt like throwing seemed to land to little resistance. But the tale of the final round was little different from the preceding frames as Rountree landed seemingly any strike he felt like throwing. Anders scored a moral victory by making it to the final bell. But it was the only victory he came anywhere near to as Rountree and his 71-19 advantage in significant strikes landed took the official judge’s decision. Scores of 30-26, 30-26 and 30-26 earned the win. Alan Jouban (16-7 MMA, 7-5 UFC) entered the Octagon for his welterweight bout against Dwight Grant (10-2 MMA, 2-1 UFC) with a nine-fight experience advantage on the world’s biggest fighting stage. But that mattered little over the course of three rounds. Jouban was unable to produce the offensive output needed to overcome his inexperienced opponent. Jouban also had a slew of surgeries following his previous bout, a TKO win in February 2018. Despite potentially his best health in years, Jouban often seemed unable to pull the trigger as quickly as Grant over the first two rounds of action. With Grant seemingly pulling away through over the opening frames, the crowd met the fighters with a chorus of boos to express their dissatisfaction at a slow-paced affair. The pace picked up a bit down the stretch of Round 3 when Jouban scored a takedown and some impressive punches in the final 10 seconds, but it was too little, too late for the Louisiana native as the judges sided against him. The official judges scores were 29-28 Grant, 30-27 Jouban and 29-28 Grant. Grant is now on a two-fight winning streak. UFC 171 feels like a lifetime ago and five years was enough time for Nikita Krylov (25-6 MMA, 7-4 UFC) to catch up to Ovince Saint Preux (23-13 MMA, 11-8 UFC). Saint Preux defeated Krylov by submission at the March 15, 2014 event, but could not hang in the rematch before tapping out in the second round. Krylov started the fight looking to attack the neck with choke submissions only to find himself in trouble when Saint Preux’s defense allowed him to survive, score a takedown and end up in dominant position on the ground. Saint Preux wasn’t able to do much with the advantageous position and looked as though his gas tank was nearing empty as Round 1 came to a close. Despite Saint Preux’s corner telling their fighter, “You’re not tired, you don’t get tired,” before the second round, it was clear the former college football player was battling his own endurance as well as the Ukrainian standing across the cage. Krylov was able to work inside on his fatigued foe, score a takedown and force Saint Preux into panic mode where he exposed his neck and was caught in a rear-naked choke before tapping out at the 2:30 mark of Round 2. Krylov is now 5-1 in his six most recent bouts while Saint Preux, who entered the fight as the UFC’s #12 ranked light heavyweight, has now lost three of four.